Visitors have until Tuesday, May 24, to view the successful exhibit “South Dakota Environments: A Window to Past Times” located in the Observation Gallery of the South Dakota Cultural Heritage Center in Pierre. The exhibit, which will be officially closed to the public on May 25, has been open for the past two years and is scheduled to be replaced. “We are always sorry to see an exhibit close, but it also allows us to make room for new exhibitions about different topics in South Dakota history,” said Jay Smith, director of the Museum of the South Dakota State Historical Society. 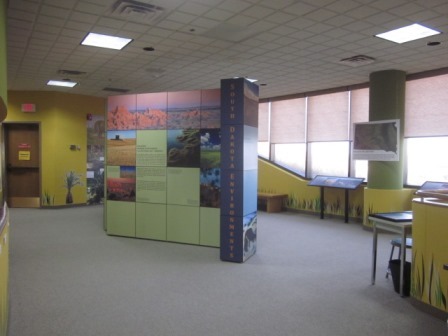 The “Environments” exhibit is noteworthy because it was the first full exhibit constructed in the Observation Gallery. The gallery had been previously used as a meeting space, awards area and a small space for two-dimensional displays. It became a dedicated exhibition space in the spring of 2014. The next exhibition to open in the Observation Gallery has yet to be named by museum staff, but it is about the built environment in South Dakota, focusing on structures built on the South Dakota landscape. Hands-on and children’s activities are planned for the new exhibition in order to capitalize on the successes of the “Environments” exhibition. “We know that our visitors like having hands-on activities as part of our exhibitions, and we will continue to build those essentials into new exhibitions,” said Smith. A video component to the exhibition will be available as well. The new exhibit in the Observation Gallery is scheduled to open on July 30. Museum hours through May 29 are 9 a.m.-4:30 p.m. CDT Monday-Saturday and 1-4:30 p.m. Sundays. The museum is open 1-4:30 on Memorial Day, then 9 a.m.-6:30 p.m. Monday-Saturday and 1-4:30 p.m. Sundays through Labor Day. There is a small admission fee for adults, but children age 17 and younger are always free.